Thank you very much for such a splendid job, she got it and she is very happy. Your imagination has no bounds, the sailboat I received is wonderful. A very interesting and imaginative food basket. My best man and his wife delighted at their birthday present. My husband enjoyed the cheeses and wine. 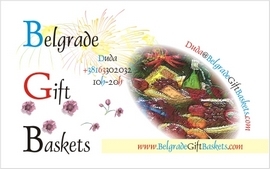 The basket looks great, I will recommend you wholeheartedly to everyone I know. The arrangement is exquisite and, most importantly, the bride and the groom liked it very much – SPOT ON!!!!!!! Thank you for everything. The gift basket which I received from my friend left me breathless. Really refreshing! I always have trouble finding the right gift for someone. You made it easy. It's clear that it takes a lot of time, imagination, and even a bit of an artistic gift to make such a wonderful gift basket. The deliveries were on time and everything turned out just the way we had arranged. We're very satisfied. We will order present from you again.